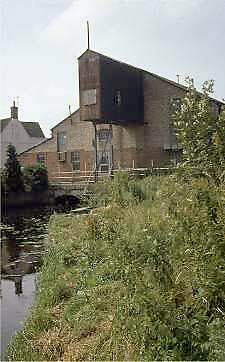 Bungay watermill, often known as Bardolph mill as it was originally part of the manor of Bardolph Ilketshall. When the mill was sold in 1784 it was powering 3 sets of French burr stones but by 1788 it only had 2 sets. Later, when the mill was working as a papermill, it burnt down and the site was then bought by later miller, Charles Marston's father, who rebuilt it in the 1870s. He fitted a roller plant in the 1890s, before the mill burned down again c.1900. 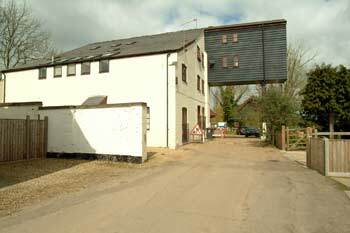 The Marstons then took over Earsham mill for flour production and rebuilt Bungay mill as a provender mill in 1902. The new mill was constructed of weatherboard and brick with a corrugated iron roof. There were almost certainly two adjacent mills in times gone by. During the Days of the Navigation, wherries would moor at the staithe and were loaded using an extended hoist. During the American War of Independance 1775-1783 Bungay, Ellingham and Wainford mills produced flour for export to America. 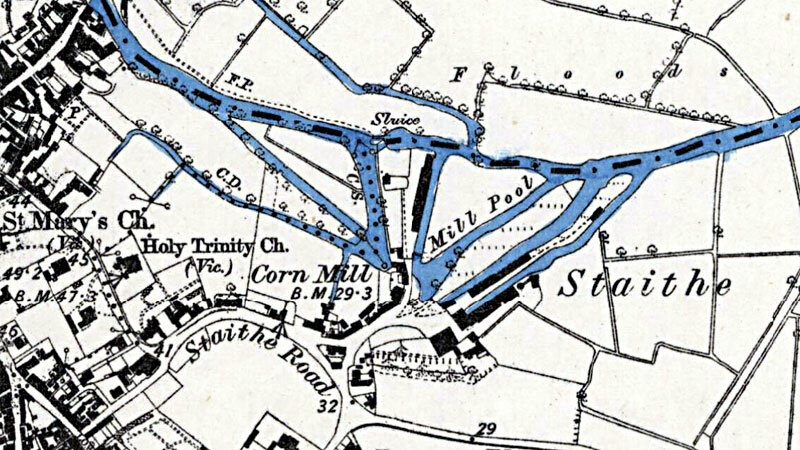 In April 1779 a dispute arose between Henry Gooch, Thomas Cotton and a group of local farmers who enlarged and deepened the watercourse of Chain Bridge Beck that was some 300 yards above the mill thus starving the mill of water. The dispute continued until at least 1781 and by 1784 Gooch and Cotton were bankrupt. It is possible that they were unable to fulfil their government contract to supply flour to America and if this was indeed the case they were probably faced with a considerable claim for damages. Henry Gooch was married to Mary Killett of Gorleston. In 1772 he was mayor of Gt Yarmouth and deputy mayor in 1774. After his bankrupcy he moved to London. In 1779 the Mills were destroyed by fire and all the stock therein being of the value together of £3,000 and upwards. The Water Lane in which the wheel is placed remaining exactly the same breadth and length as before the Mills were destroyed and the depth or lower floor thereof was sunk lower by about 6 inches in order the better to admit of a higher Water Wheel than before, which was recommended by the Engineer (Mr. Nickalls) on account that it in consequence of the increased height would work with less water. Charles Marston who owned the mill in the early 1900s was was born in Brooke in about 1844 and the 1861 census lists him as being apprenticed to Mr. S. Freestone in Hempnall_Field_Lane_Tower_Mill. By about 1870, Charles Marston was working Bungay watermill. Charles Marston was very particular and ensured that the corrugated iron rood was painted in red ocre every five years and the whole area around the mill was kept weed free. Unfortunately, due to a gangrene infection Charles Marston was forced to have a leg amputated. The operation was carried out on the kitchen table and his leg was then buried under an apple tree in the mill house garden next to the mill. At least three of his sons were millers, Charles Candace, at Bungay, Alfred Thomas, who also worked at Bungay and Earsham until 1902 and Carlos who worked for Parker Brothers Millers at Barton Mills, Suffolk and who then went on to purchase the water mill at Icklingham, also in Suffolk. 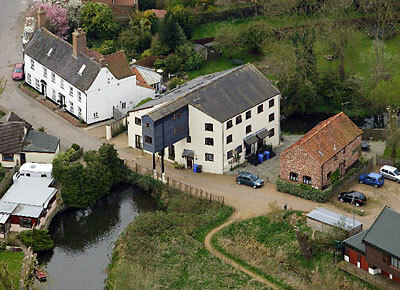 Icklingham Mill ran under Marston direction until it was sold in 1990. Charles Candace Marston was born in the Mill House in 1882 to Charles Marston's second wife. He grew up learning every branch of his business as if it was his hobby. 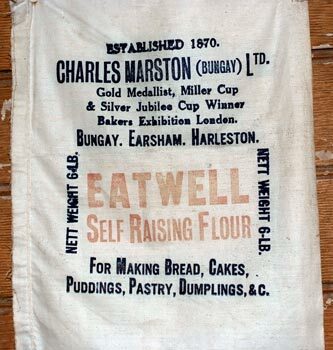 In 1919, Charles Marston died and the flour mills at Bungay, Earsham and the 3 sack/hour plant at Harleston were passed on to Charles Candace Marston. Charles Candace Marston was an extremely successful miller winning The Miller Silver Challenge Cup in 1923. At one point a roller mill was installed but this only ran for a short time. Wanted to purchase, in good preservation. a 5 or 6 horse power steam engine, with 7 or 8 h.p. boiler; what maker and when last at work. Charles Marston, Water Mill, Bungay, Suffolk. Wanted an undershot Water Wheel 12ft. to 15ft. high, 10ft. to 16ft. wide, with first motion wheels. Secondhand or new. Apply to Charles Marston, Water Mill, Bungay, Suffolk. Charles Marston's self raising flour plant was some 100 yards away from the mill occupying premises that later became the Staithe Garage. Harry Hall worked there and sold flour to customers in Kings Lynn, Norwich and Ipswich, normally in 10 stone bags. Harry Hall was brother in law to Charles Candace Marston who had married Harry's sister Kate (1883-1972). Billy Patrick was the carter to Charles Marston and was known as 'Midnight' Patrick on account of his frequent late return home due to his habit of calling in at numerous pubs whilst on his rounds. On one occasion, whist passing under an oak tree, he heard the voice of God telling him to give up drink. This he promptly did and subsequently became a staunch member of Bungay Salvation Army. Sadly, the pair of horses he drove perished in the fire of 25th February 1902. At one point after the mill had been rebuilt, the wheel was replaced by a turbine installed by Gilbert, Gilks & Gordan of Kendal. However, the changeover only took place on the understanding that if the turbine did not perform as well as the wheel, the wheel would renewed and reinstalled. This is precisely what happened. I have spent the last year researching diesel oil engines made by the Brush Electrical Engineering Co Ltd of Loughborough. During this research, I found the production records for these engines and can advise that in October 1934, Charles Marston of Bungay, Norfolk (tel: Bungay 40) ordered a Brush engine. Built under works order E130 and carrying serial number 176, it was a four cylinder diesel, type 4S10, developing 200 hp at 290 rpm. It was delivered to Marston in March 1935. There is a general arrangement drawing of this engine, but unfortunately, it does not show much of its situation within the mill.